NATURALLY BEAUTIFUL VANCOUVER WELCOMES YOU!! 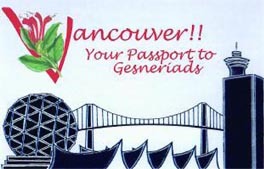 The Vancouver African Violet and Gesneriad Society hosted the 54th annual convention of TheGesneriad Society in Richmond, British Columbia, Canada. The local chapter members, well organized by Arleen Dewell, welcomed the 191 convention attendees, including 47 first-timers, about half of whom came from various distant provinces in Canada. The convention hotel, the Radisson Vancouver Airport Hotel, was well located in suburban Richmond with many stores and restaurants in the area. The new Canada Line metro station just a block away and many bus routes nearby made it easy to take trips into downtown Vancouver and its surroundings. The lure of a bus trip on Tuesday to the home of Bill Price and Brian Murfitt in West Vancouver to see Bill’s plants and enjoy their gardens and a home-cooked dinner brought many attendees earlier than usual during convention week. A highlight of judging school on Wednesday was the workshop where volunteers enjoyed role-playing various types of judges and clerks acting out some hilarious but enlightening past judging team experiences. The convention trip on Thursday to the UBC Botanical Garden and Southlands Nursery was enjoyed by many who went in spite of the rain showers. Saturday’s closing event had beautiful weather with smooth sailing around Vancouver Harbour on the “Pride of Vancouver” yacht while conventioneers enjoyed dinner, drinks, sunset, and the company of friends old and new. During the week, convention attendees had the opportunity to attend four lectures: “Hunting Gesneriads at the Edge of the World” (John R. Clark), “The History of Saintpaulias and Other Gesneriads in Russia” (Vladimir Kalgin), “Cuban Gesneriads: Botanical Treasures of the Caribbean” (John L. Clark) and “A Proposed New Classification System for the Species of Columnea” (James F. Smith). The Gesneriad Hybridizers Association meeting featured a program by Dale Martens about Canadian Hybridizers. At a conservation meeting, the Society’s new Gesneriad Conservation Alliance was described by John R. Clark. The many offerings in the plant sales room gave attendees and visitors the opportunity to add whatever they wanted to their own collections. The silent and live auctions are always fun events and successfully raised money for the Elvin McDonald Research Endowment Fund. At the breakdown of the show, Bill generously offered cuttings from many of his 40 show plants which meant listing even more gesneriads on the phyto forms required of everyone leaving Canada with plant material. The flower show was of very high quality and variety with 184 entries from 40 exhibitors. Enjoy these photos of blue-ribbon exhibits from the flower show and of convention.